Sometimes we have a dive where we get obsessed with analyzing it afterwards. Or maybe you're like that all the time! Either way, wouldn't it be nice to look at a "piece" of the dive? 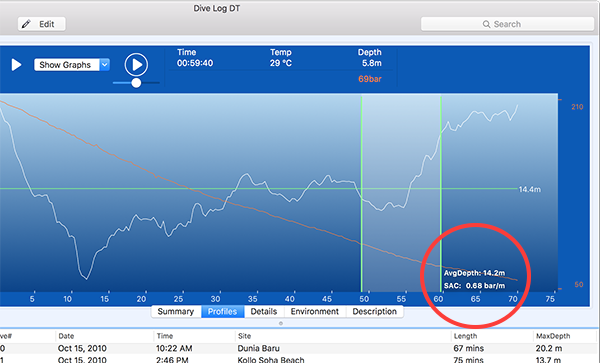 On the Environment tab, if all of the required information about your tank is filled in, you can get a SAC Rate (RMV) over the length of the dive as shown in the photo above. If you only used one tank over the course of your dive, then the SAC rate for this tank will also be for the whole dive. Unless you're doing some technical multi tank diving, this is the case for most people. Dive Log, Dive Log Manager, and DiveLogDT all use the Respiratory Minute Volume (RMV) method of calculating your SAC rate so that you can compare your rate over *all* your dives, regardless of which tank (size) you used. This is the volume of gas you breathed in 1 minute at the surface. If you use Imperial units, it will be "cubic feet per minute", and if you use metric units, it will be in "liters per minute". You can use this number to plan a future dive, regardless of what kind or size of tank you will use. If you want to take a "deep dive" into analyzing your SAC rate for a particular dive, you can do this on the profile tab. 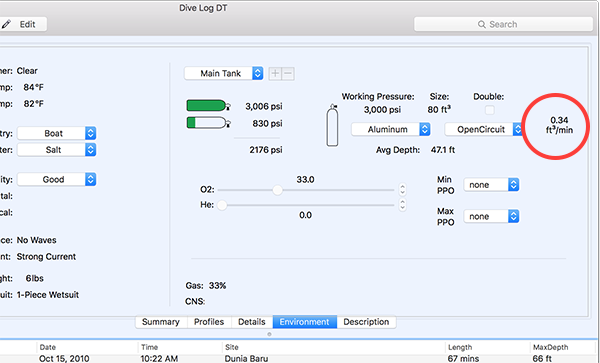 (This assumes you have a dive computer that logs your tank pressure over the course of your dive). In the image above, we're looking at the same dive as the first image, however we're looking at just a portion of it. By "clicking (and holding) and dragging" over the time axis of the graph, you can select a *portion* of time and find out what your average depth was for that portion, and what your average RMV rate was for just that portion. From the images, we can see that Jane Diver had an average RMV rate over the course of the whole dive of 0.34 ft3/min and an Average Depth of 47 ft. But in the second image, while starting her ascent at the end of the dive, she had an average RMV rate of 0.26 ft3/min while still maintaining the same Average Depth. Apparently she was much more mellow on her way back! When clicking and dragging, you can look at the "Time" value at the top of the profile to determine exactly what portion you are looking at. It will change when you click, and update when you drag, so that if you want to know exactly the period of time you're analyzing, you can. We have had some requests from customers to show a different kind of SAC rate calculation, sometimes called "Surface Gas Consumption". This is an absolute measure of gas over time, and is only useful when using the same kind and size of cylinder over subsequent dives. It is simply the amount of gas you have used in a period of time, adjusted to the surface pressure. Again, if you're using Imperial measurements, this number will be in "psi per minute", and if you're using Metric units, it will be in "bar per minute". We have added an Application Preference to toggle between the two kinds of SAC measurements. If you open the Preferences Window, navigate to the Profile tab, you will see a checkbox at the bottom "Calculate SAC (not RMV)". If this is checked, you will instead see a "SAC" rate when selecting a portion of the dive as above. The image below will show SAC rate using Metric units.